GMAT time shortened – Graduate Management Admission Council (GMAC), which conducts Graduate Management Admission Test (GMAT) world-wide has announced that. Effective 16th April, the testing time will be reduced to 3.5 hours from 4 hours. This is good news for students who want to score better in GMAT. 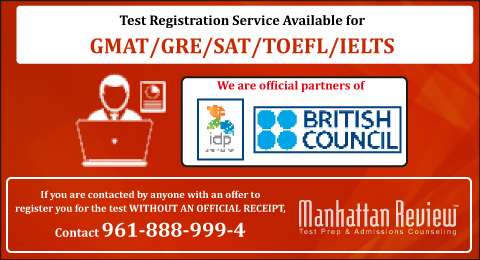 Manhattan Review (MR) provides excellent and highly popular coaching for GMAT. Our students are already studying in the top Business schools throughout the world, after scoring very well in GMAT. For more information on our test preparation and admission services, contact any of our centers nearest to you. Please go through the below information, in order to register for any of the tests. Not just for test preparation, but for registration too, Manhattan Review takes the lead! Now, our students who wish to enroll for the IELTS test can make a cash deposit in any of the HDFC Banks nearest to them. This is the easiest way to pay for IELTS when they register through IDP Education India. This service is available effective 4th April 2018. We are pleased that our students are getting into universities across USA, UK, Australia, Germany and Canada. Most of our students have admission confirmations from majority of their applied universities. And, they are getting ready to apply for the visa. MR is proud to assist our students for not only test preparation and admission, but also with the most complicated & cumbersome process – the visa process. With unerring guidance and support from us, our students are able to successfully get their visas till now. Our success rate for visa guidance is second to none! Our training for students during visa mock interview sessions is highly popular and much-talked about among the student community. So, whether you have an admission on hand or looking for comprehensive guidance right from the beginning, Manhattan Review is the most reliable partner to help you with your dreams of studying abroad. Meet us and we will help your dreams take a wonderful and successful shape!